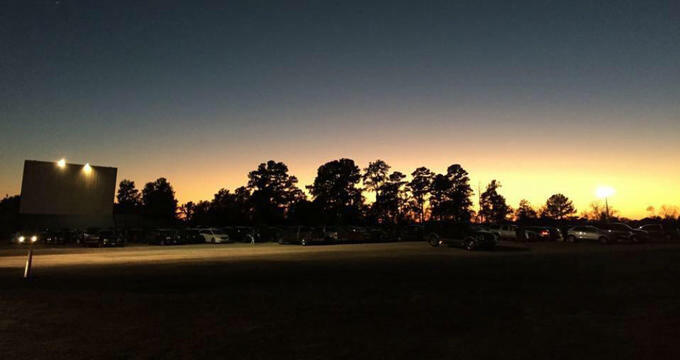 As one of the few remaining drive-in theaters in the country, the Showboat attracts families not only from all across TexasTexas but also from all across the country. Bring the family and enjoy a movie as they used to be enjoyed, from the seat of a car. The Showboat Drive In takes its name from the owner’s history, which traces its roots back to 1952. The current theater was opened in 2006 by Chris and Johnny Rumfolo. It is family owned and operated and modeled after their grandfather who owned another drive-in theater (also called The Showboat) in Houston, Texas. This Showboat has called Hockley, Texas home since it opened. Although 35MM films are becoming harder and harder to get, the owners are determined to continue to offer this unique, retro way of viewing movies with the whole family. The Showboat still shows both old and new movies on a daily basis, which is the main draw of visiting the drive-in theater. Movie information is updated on the drive-in website every Tuesday, and movie choices change on Fridays (although certain, more popular movies may be shown for more than a week at at time). Admission to the theater is provided with a ticket, which allows guests to see two movies back to back on a single screen. It is important for all visitors to know that cars are not allowed to idle while watching movies; they must, instead, be totally turned off for both safety and to allow for better audio of the movie. Guests should arrive to the theater at least one hour prior to the first showtime to make sure they have a good viewing position from their car. However, if visitors intend to only view the second movie, it is recommended that they arrive about half an hour prior to the movie’s starting time. Starting times can vary due to the time the sun sets every day (movies generally start around dusk). Audio for each movie will be broadcast over an FM transmitter that can be accessed either through a standard car radio or by bringing a “boombox” radio that can be powered by battery. Pick-up trucks should park in reverse to allow the tailgate to be used as a seat - bring pillows, blankets, even chairs. Lawn chairs can even be placed in and around a car for visitors who don’t want to sit inside their car during a movie. Just make sure to not take up an additional parking spaces or block any other guests from being able to view the movie. Do not sit on top of the car. RVs and motorhomes are always welcome but must park in the very back row. The speed limit on the drive-in grounds are 5 MPH for the safety of all patrons, especially the many children who visit. There is also a playground located on-site to allow for a safer place for children to play, although they must be supervised at all times. Well behaved pets will be allowed as long as they do not disturb the enjoyment of others at the drive in. The Showboat Drive In is well known for its many different special, movie themed events offered throughout the year. The majority of these events are offered free along with a paid admission to the drive in. One of their biggest events is their annual showing of Grease. This movie is regularly held as a sing a long style event where visitors are encouraged to sing along, dress up, and participate in the festivities. People come from all across the country to enjoy the fun. They also regularly hosted other themed events, especially around the holidays. Keep an eye out for them on the calendar and website, or just signing up for The Showboat newsletter. In the past, the drive in has done big events for Halloween including decorations, scary movies, and staff members dressed in costume. Another big draw are their Fido friendly nights, where dogs are not only allowed but encouraged to come and movies that relate to or revolve around dogs are shown. Guests visiting The Showboat can choose from a large number of traditional movie theater snacks like buttered popcorn, candy, soda, nachos, hot dogs, and more. Visitors are not allowed to bring in their own outside drinks or food. The kitchen will close after the intermission. There are also souvenirs available for purchase at the snack bar as well, including shirts and keychains.